Well, this is a surprise. 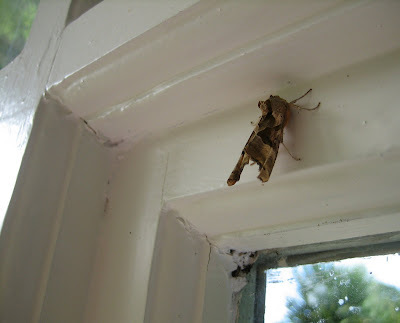 I've been in London and wasn't expecting to find anything moth-related. 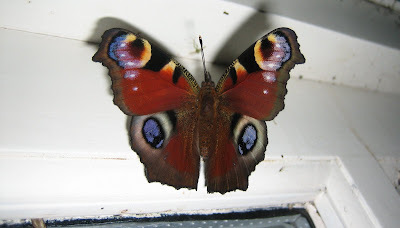 But here in the tiny window box of my son's flat is...a caterpillar. A marvellous tribute to Nature's powers of dispersal - and survival, in the way that grass pushes up through tarmac. 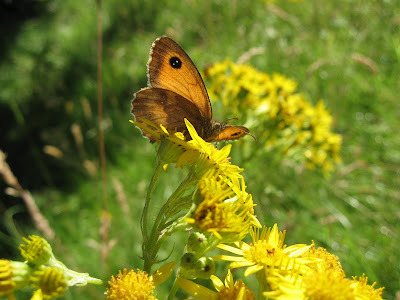 The straggly nasturtiums are an island of greenery far (in moth terms) from the nearest park. But there are some good, big street trees, as you can see, and if you look carefully at the surrounding buildings, little sprouts of weeds are clinging on in various crevices behind drainpipes or in uncleaned gutters. Good luck to this caterpillar. 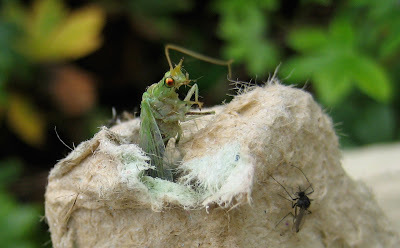 Maybe I will bring you a picture of its chrysalis or cocoon in due course. Stop press: I just had a closer inspection of the nasturtiums and there are TWO catties there. Here's the other one, having a nap on the soil. Actually they both seem to be asleep at the moment. The other one hasn't moved in the half-hour or so since I photographed it. Excellent! We are all still here. Mind you, they haven't started colliding the particles underground in Switzerland yet.. Still, England beat Croatia 4-1 last night, so something has happened to the Earth's atomic structure. 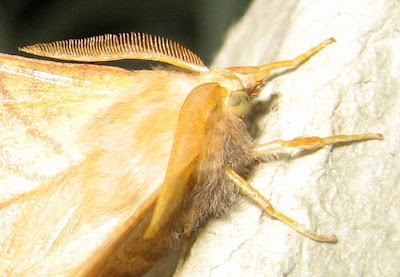 Meanwhile, here is a moth giving you the eye. Or two eyes. After a completely dismal night on Tuesday, things warmed up pleasantly yesterday. There were Red Admirals, Speckled Woods and a Holly Blue in the garden during the day, and the evening was almost sultry. 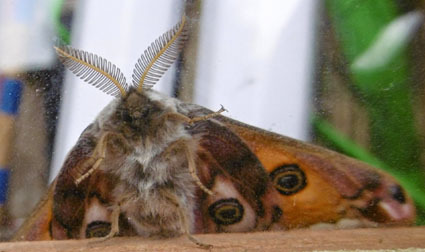 Very mothy weather. It's drizzling now, but in the trap there were plenty of interesting things, prime among them this beautiful Pink-barred Sallow. It says in my book that it's 'common', but this is the first I've met since I was born in May 1950. 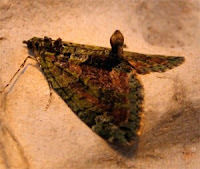 Incidentally, the green moth is bathed in an eerie glow because it's getting a bit overcast in the morning now, and I thought a little illumination would help. So I wore a head-torch, a bit like a miner's helmet lamp, while simultaneously juggling eggboxes and the digital camera, perched on its becoming little tripod called Miranda. Given that I was in my dressing gown as well, this must have been an inspiring sight. Luckily there was no one else there to record it. Now it's much later on and I've been to Kendal and back and have found my Waring, Townsend & Lewington. 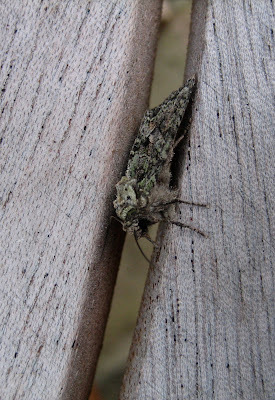 From this I deduce that the above are: squeezed in the table gap, a Brindled Green. 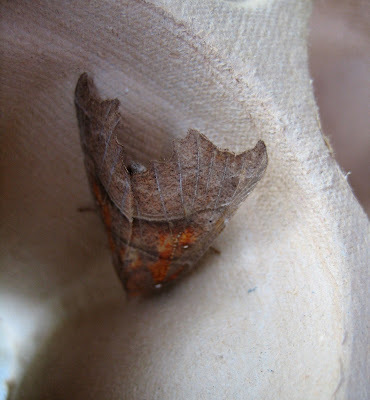 Then, small, a Purple Bar, a Copper Underwing and a July Highflyer. As ever, nice names. 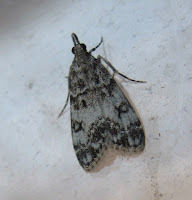 I was pondering over this Green Arches this morning and wondering why more British moths, and butterflies, don't have the colour green. Even when they do, it often appears only in subtle flecks, as here. After all, the world they live in is overwhelmingly green. When I take a photo of what my eye sees as a flower bed full of colours, the result is green, green, green, with just sprinkling of blues, reds and yellows. I was picking runner beans yesterday, and they also show the effectiveness of green as camouflage. It's quite tricky detecting bean from leaf or stalk, and some grow enormous as a result. 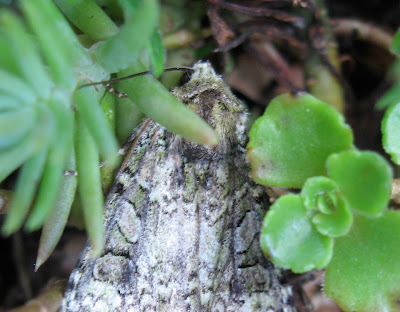 Yet moths are famously ace at camouflage. Through evolution, some have proved to be as clever as chameleons. 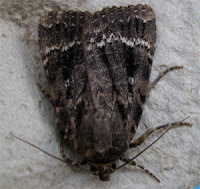 The Amulet moth has three different forms in England alone - whitish in chalkland areas, russet in South Devon where the sandstone is a similar colour and much darker in Surrey, where the soil is black. 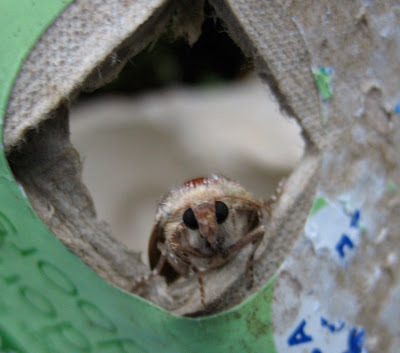 Maybe soil and stone are the answer, for the adult insect. Perhaps they are at most danger when at rest in the daytime. 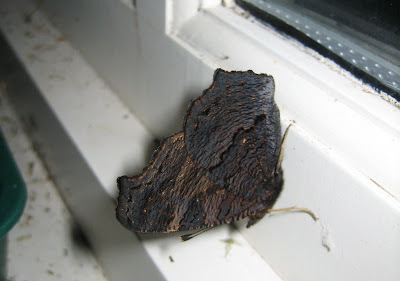 Certainly, moths have a famous propensity for resembling old leaves. They have got green in their genes, though. It's the favourite colour of their caterpillars, which lends weight to the daytime theory. The Very Hungry Caterpillar is well-named. They spend all day munching green leaves and grass. 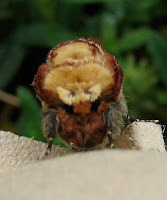 After discussing the Setaceous Hebrew Character yesterday, I idly looked it up in Moths by Prof Edmund Ford, the Bible of Bibles, and discovered an amazing fact. He says that shortly after the Robinsons invented their wonder-trap at the end of the 1940s, no fewer than 50,000 Setaceous Hebrew Characters were caught in a single trap in Hampshire during the course of one night. Fifty thousand? It beggars belief. 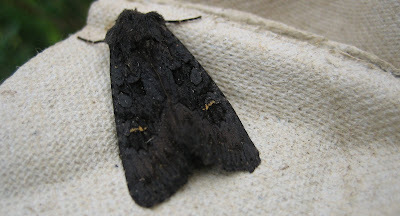 But Ford makes a point which should be noted by anyone nervous about eco-doom when he goes on to say that the then new practice of light-trapping had "shown that some species long thought to be rare are abundant, and others exist where they have never before been recorded." There still aren't that many of us looking. Anyway, if you follow the British weather, you will know that we are all building arks this weekend. Torrents. 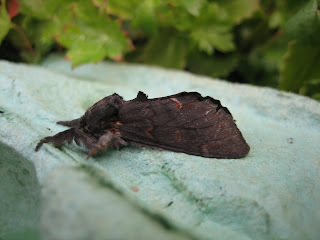 So here's a dip back to July and an Iron Prominent which I didn't show you at the time. It looks poised for some menacing action. Also, smaller pic, this is what it looks like for a flower as a Buff Tip approaches. There's an end-of-season feeling this morning. It's cold and wet again and I sense that trapping days are numbered, for this year. 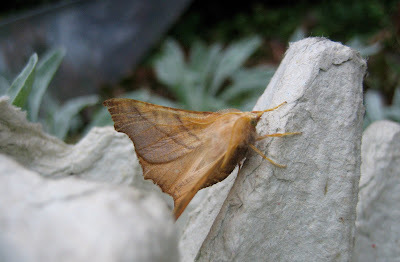 Only half-a-dozen moths were snoozing in the eggboxes this morning, but this is an interesting one. It's very common; I should have mentioned it before. It's the Setaceous Hebrew Character and it comes trailing clouds of glory. 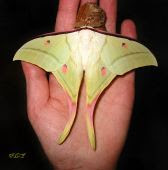 According to legend, this moth was present when Moses received the Ten Commandments from God but was not allowed to see the divine face. 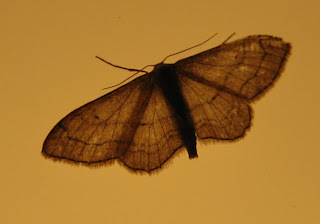 The moth, however, did. And because it confessed this dreadful fact to God at once, it was rewarded by having the Hebrew Character 'Nun' imprinted on its wings instead of being smitten as happens to so many people and things in the Bible. According to the excellent website www.flwildflowers.com, 'nun' is also shorthand for 'miracle' which is what this presumably was. 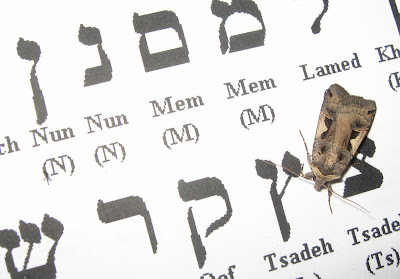 The website adds charmingly that in Yiddish accounts the moth is described as 'fermisht', or 'all shook up', and says that the exchange on the mountain was possible because 'the language of moths is something that only the Divine knows.' So, now you know too. Setaceous, btw, means 'bristly' or unshaven. 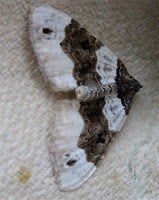 There is another moth in Britain called simply the Hebrew Character, which also has a 'nun' mark but less distinct. Why this one is considered unshaven, I have yet to discover.